Hands down, this is my new favorite fall scent!!! I am not one who really latches on to anything foody, scent wise, but I had to give this one a try and boy am I glad I did. On me, this scent is slightly smokey, a little woodsy, and the maple gives it just the right amount of sweetness. The scents just blend together so well. I really get the feel of having breakfast by a fire in a cozy cottage in the woods! I honestly cannot tell you how much I love this scent. It is so comforting! So I typically associate maple scented body products and candles with the smell of wet diapers. It generally just is really not my sort of scent, but Angela is a miracle worker so I wanted to give this one a chance. I am so glad that I did. She was right that MI and Smoky Mountain Mallow have a similar feel (though I'm still partial to SMM, especially layered with Manor. You must try this!!!). But Maplewood Inn is quite nice! It's very warm, and on my skin, the woody notes stay in the background and the sweet, maple-y, smoky notes are up front. It all dries down to a smell that reminds me of the dregs of a cup of milky tea and maple syrup. I probably won't buy a bottle of it but I will enjoy the heck out of my sample. This is what I wanted Witch's Cottage to be. While WC was too foody for my taste, Maplewood Inn's sweeteners is tempered by dry spices and woodsmoke. The maple is not syrupy, I think since woody notes are involved it has more of a maple sap dripping from the tree feel. I will be ordering the full size! Body chemistry can make a scent so different on different people! Witches Cottage was definitely not foody on me, whereas Maplewood Inn dries down to a straight maple syrup smell on my skin after an hour or so. I still think it's a great fall scent, though - very much worth trying whether you are a foody person or not. Body chemistry can make a scent so different on different people! Just want to add that I tried the ganache in the Maplewood Inn scent and it is wonderful! The chai accord emerges right away for me, and stays for at least 20-30 minutes, and the maple-smoke scent lasts for a long time too. The maple syrup dry down is detectable quite a few hours later. It's a great scent - I'm looking forward to seeing what the perfume does as it ages. It smells sweet, maple-y, spicy and woody. Overall a very complex yet recognizable scent. As it fades, the spices die out leaving a sweet maple wood scent. Funny thing about that, the first time I put it on, I had dinner about 5 hours after the application of Maplewood Inn and I kept wondering if I was smelling maple sausages on myself after dinner. (I had sausages that night.) After a while, it finally hit me, I was smelling Maplewood Inn! Layered over Manor, it reminds me of old vintage-style sugar-shacks. I definitely need a full-size of this. Now the question remains, do I get the perfume or the burnishing glacé? Edit: I wore Maplewood Inn again today and 7 hours in, the scent reminds me of meat again... At first, I thought "ham?". And yes, the smokey sweet maple scent reminds me of smokey Black Forest ham drowned in maple syrup. Opening with a fanfare that is reminiscent of some of offerings of Serge Lutens or Slumberhouse, Maplewood Inn was a wonderful surprise on first application. Reading through the ingredients, I had expected this to be a overly sweet gourmet maple syrup and chai fragrance, but instead was surprised how the woods and spices prevented it from going too far towards a pure maple syrup fragrance. Don't get me wrong, it is definitely a sweet fragrance but I suspect is caused by the amplification of the sweet attributes of the ingredients as they play off each other, rather than deliberate overkill. The woods and Benzoin have a definite tobacco effect, though I did not find it as smokey as some of the other reviewers. The complexity is fascinating and it is a very well blended fragrance. After a few minutes the volume of the fragrance does drop, though there is quite good sillage for several hours. It has wonderful duration on the skin and was still clearly obvious 16 hours later. It is interesting to read the different reviews and I think that this fragrance must be one that behaves very differently on different people's skins - which I also find fascinating. Because of that very reason, I would suggest sampling first. As for myself I have already ordered a full bottle. I got this perfume for christmas and I have to leave a review for it. When I saw the description I knew I would love it, and I'm certainly not disappointed! This is by far my favorite perfume now. After getting dark ginger spicecake, spiked nog & nutmeg and a sample of black forest (which I need a full size of) I realized woodsy foody scents are my favorite. Maplewood inn is very woodsy with a touch of sweetness. It's not a heavy incense-y scent, but it is quite dark. It's woody, slightly tobacco-y. If you like dark ginger spicecake you'll probably like this one. It's more of a mix of wood scents, rather than the mostly patchouli in dark ginger spicecake. It's also not as sweet. Maplewood inn is more toned down and evened out compared to dark ginger spicecake. The maple is not strong, atleast not to me. I can smell the spice from the chai accord more. This perfume is also one of the longest lasting that I have. It lingers all day and makes the wrists of the clothes I wear scented until I wash them. To me, this is heavy rich maple syrup and a roaring fire. Definitely a cool weather scent, but even then, it's a bit overpowering for me. This is the perfume that truly captures Angela's craftsmanship, imho. 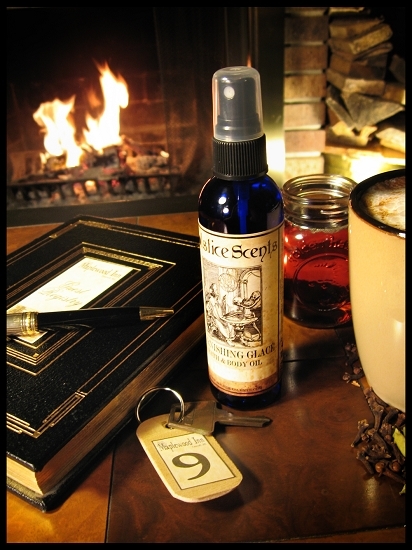 The benzoin, the smoke and wood renders the perfume an incensey quality. I am so happy i got to test it and now i own a full bottle and will use it religiously in late fall. I love this fragrance. It's like Fall in a bottle. My skin amps sweet notes up to the moon, though, so I get vanilla, maple, and not much else when I put it on alone. Happily, it layers very well with Library, which lets me temper the sweetness a little and accentuates the wood and smoke notes. If you haven't tried blending the two, you really should! It's that cup of vanilla chai, a piece of maple sugar candy, and a favorite old book in a well-worn leather lounge chair by a roaring fire. In late October. Sounds like a perfect day to me! This scent really morphed on me after a few months! When I first tried it (and every time for 6 months or so thereafter!) it just smelled like burnt maple and acrid smoke. I was so disappointed, but wasn't willing to give up as I knew some perfumes just needed a rest. About 6 or 7 months after receiving this, I tried it again for the tenth time and was shocked to find that it smelled like maple, woodsmoke, and chai! What a transformation, and it's because of this one that I can't destash within a year of purchasing a scent, just in case! Maple, sugar, woods, benzoin, and real woodsmoke. For whatever reason the smoke in Smoky Mountain Mallow smelled artificial and too strong on me but the smoke in this scent really works and smells real. The benzoin makes it smell like an actual fire is burning. I really, really like this, it is very warm and comforting. The maple syrup note was a bit scary to me but even when it dries down to mostly maple the benzoin and woods cut the sweetness. To me this is more rich maple than sweet, closer to real maple syrup or even maple sap than Mrs. Butterworth’s. First on, this is a cocoa-dusted sandalwood (very smooth, dry, sweetened woods) next to a fireplace. It smells a little ashy, a little smoky, and warm and glowing from the amber and chai spice. It's like an idealized fireplace smell that's low on the smokiness. The spiciness in the drydown starts to go a little off on me, though. I get whiffs of real maple syrup every once in a while, and something about the spices, maple & smoke start to turn odd and savory on my skin. It kinda makes me smell like a maple and spice seasoned ham. I'll stick with Smoky Mountain Mallow for my foodie-smoky-goodness. Ooh, this is a good one. Their maple-spice-candle (like in Kitchen and others) is a major note, but this one’s not quite as gourmand as those; it’s got a fair amount of wood both fresh and smoky, like a fire burning in the hearth with a pile of newly split pine logs next to it. Gives it an incense angle that I really love, on top of the sweet mug of chai. Reminds me of fireplaces and bonfires at the family beach cabin, plus sweet baked goods and warm drinks.